Photo Shoot - The Costume Impersonators of LA ~ Cosplay Kulture! 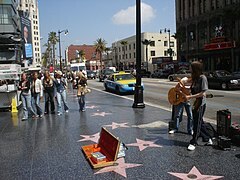 You've seen them on the 'Walk of Fame' in LA, posing for tourists and kids. You know they're not really cosplayers but they're there, doing their thing. 1 photographer, Nicolas Silberfaden, decided to make a statement with his photos by gathering these guys together and just let them be sad. "Due to the current economic, social and cultural crisis in The United States of America today, I have decided to do a photographic project consisting of a series of studio portraits of superhero and celebrity impersonators that live and work in the city of Los Angeles. Most of them unemployed Americans, they decided to suit up with their costumes and hit the streets, animate parties and events in efforts to make ends meet. Making them pose in their costumes against a colorful backdrop, I ask them to manifest feelings of genuine sadness – honest emotions that are a consequence of our current times. The result is a somber, striking visual image that contradicts the iconic nature of strength and moral righteousness typical in American superhero and celebrity imagery. Creating the illusion that Superman does exist – that he too was fallible and affected by America’s downturn"